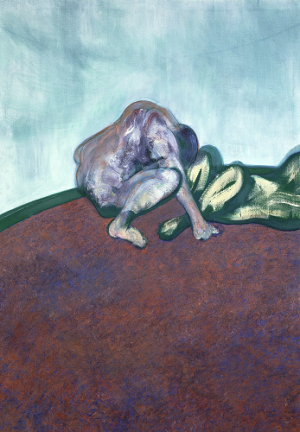 Francis Bacon (1909-1992) is celebrated as one of the greatest iconoclastic modernists of the 20th century and one of the most significant painters ever to have worked in Britain. ‘Two Figures in a Room’, 1959, on loan to the gallery from the Sainsbury Centre for the Visual Arts at the University of East Anglia, is one of Bacon’s finest works in any UK public collection, and is the first ever to go on display at the Barber. This disquieting image from Bacon’s middle years features two naked figures, usually interpreted as male lovers, and was daring and provocative at the time of its creation, when homosexual acts in private between men were still illegal in the UK. Works by Matisse, Degas and Michelangelo have been suggested as sources for the two figures – and its display among the old master paintings of the permanent collection simultaneously suggests the debt and influence of historic art on modern painters. This painting is no longer on display.